With family and the entire student body in attendance 26 knights were inducted into Mount Michael chapter of the National Honor Society. Current members spoke on the values of the NHS which the inductees swore to uphold. 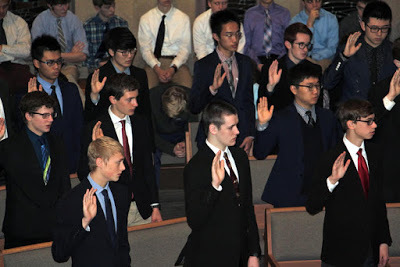 Nicholas Akers, Laken Beller, Calvin Benson, Ming Hint Chui, Patrick Collins, James Crotty, Erik Degener, Matthew Draper, Shintaro Fujita, Jacob Gathje, Joseph Hitzemann, William Janecek, Ian Kim, Sanggyeom Kim, Kolton Koubsky, Cole McCoy, Cole McNally, Ian Miller, Alexander Payne, Benjamin Quinlan, Alexander Schrier, John Schroll, Joshua Snyder, Brayden Whitaker, Andrew Wilson, Harry Yin.